I love wordle, and never thought to use it to illustrate something like this. Fun. Well it wasn’t hard for me to pick out which is which — the contrast was pretty obvious. I’m really not sure what differences you would have expected that aren’t there. 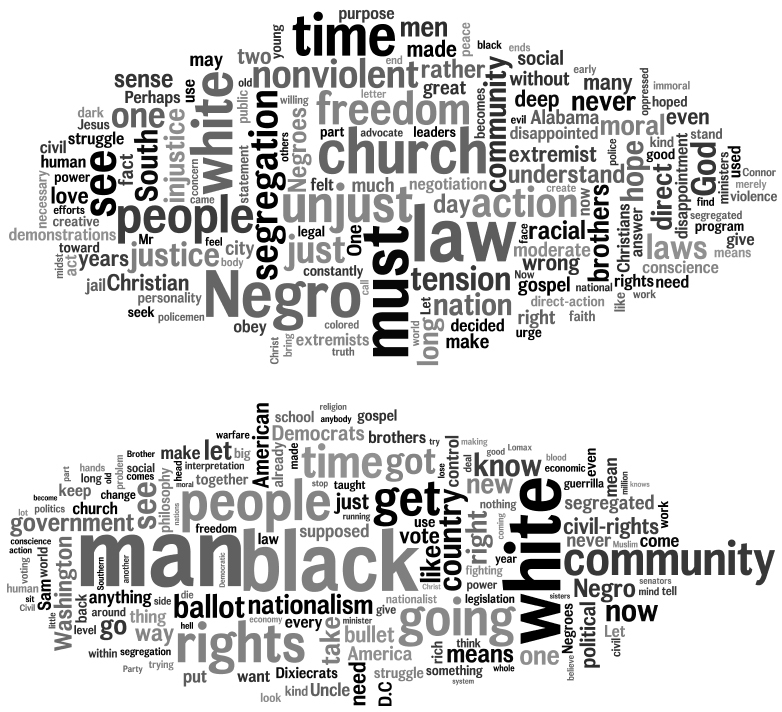 Most specifically, the bottom Wordle has a big, dark “white” prominently displayed, while the top has it much smaller. That’s the first, most obvious tip-off. Agree with Ragtime that the difference seems blindingly obvious to me. So much so that I’d like to hear more about what made you think it would be tricky. I think I would find it harder to distinguish a Daily Kos from a Red State Wordle than to distinguish those two. Which I guess is a way of saying that I agree with the point of your last two paragraphs that comparative Wordle analysis of opposing political positions would be interesting, but find your choice of point of entry an odd one.